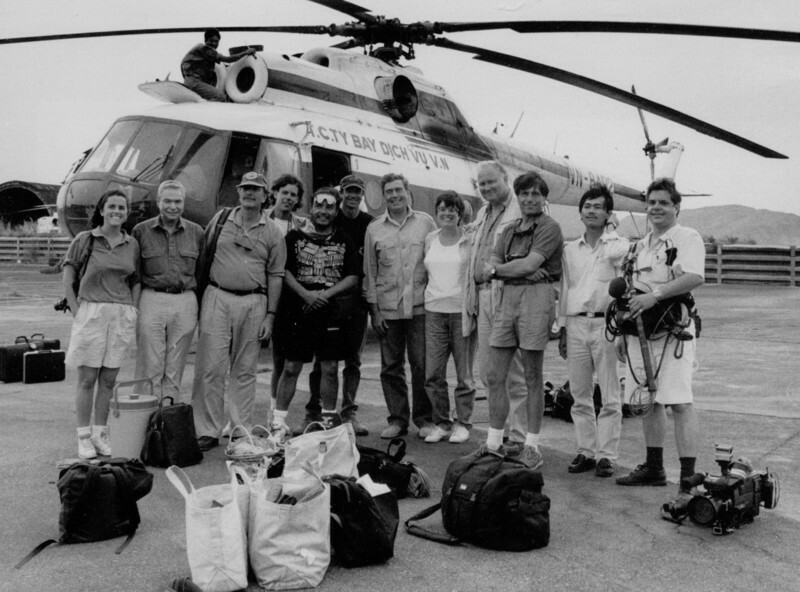 Picture - CBS Reports team on the way to Vietnam. Rather (Dan) Papers, Box 78 Folder 7_0004, Howard Gotlieb Archival Center, Boston University. Dan Rather had big shoes to fill when joining CBS Reports. Conceived by Frank Stanton, CBS Reports premiered in 1959, succeeding See it Now (1951–58) the newsmagazine created by Edward R. Murrow and Fred Friendly. 1959 is generally regarded among historians of the media as the beginning of a “golden age” of television journalism; one that had an unusual source. Following the 1950s quiz show scandals, networks promised during Congressional hearings to increase public-interest programming in return for an exemption from the threat of tightened federal regulation. Shows like Eyewitness to History and CBS Reports on CBS, and White Papers on NBC, paved the way for more than two decades of long-form documentaries devoted to a single subject treated in a journalistic style. As James Roman put it in his 1989 book on television, “it soon became apparent that [CBS Reports] would address contemporary themes in a confrontational manner. . . . The series matured during the 1960s and 1980s and became a forum for serious analysis of matters of public interest. Some of its more notable efforts included 'The Selling of the Pentagon,' 'The CIA’s Secret Army,' and the five-part series 'The Defense of the United States.'" During his 12-month tenure at CBS Reports, Dan Rather contributed to a dozen shows, including some on misuses and abuses of prescription drugs, the congress, the myth of the I.Q, and vinyl chloride. He did special such as the “Battle of Afghanistan,” in 1987 and “Murrow vs, McCarthy: When America Trembled,” in 1994. Preferring the fast pace and regular schedule, Rather eventually joined the 60 Minutes team in December 1975 and then became the anchor for the Evening News in 1981. He continued, however, to participate over the years to investigate reports for CBS Reports, enjoying the opportunity to delve more deeply into topics. Starting in 1993, CBS Reports was reincarnated and Dan Rather did a handful of such long-format reports. Schaefer, Harry, "Effluent Pours from the South Charleston Union Carbide Plant." Wikimedia Commons, 07 March 2016. Advertisement for CBS's "The Guns of Autumn" in the New York Times, September 5, 1975. Advertisement for CBS's "The American Assassins" in the New York Times, November 25, 1975. Picture - Dan Rather on the set of "Who Killed JFK?" Martin (Christopher) Papers, e_marti_0005, Briscoe Center for American History. General Schwarzkopf and Dan Rather in CBS's "D-Day." Rather (Dan) Papers, 014_2014a002_002, University Archives, Sam Houston Sate University. Still Image - Peabody Award for "In the Killing Fields of America," 1995.